All went very well. The city life at L'viv, Khatyn National Memorial Complex was heart wrenching, wine tour in Chisinau at Cricova was amazing! The Cognac tasting was also a great add-on although it was not on the itinerary. We also were impressed with the Museum of the Great Patriotic War. The restaurants and food were very good and Jonathan did a good job of selecting choices. Hotels were mostly excellent, all with great locations. Great trip. I thought the excursions were all good and had common history. The buses were very good, as were the hotels. The meals were excellent in all cases. Usually local fare and they exceeded my expectations. Loved the museums and art galleries. The meals more than met my expectations. Jonathan was an excellent leader, kept us informed about happenings, changes, etc. Great personality, fun to be with and just basically ran a 'good ship'. Organized great tours and guides and handled any changes expertly. Would travel with him again anytime. Was an excellent tour and I highly recommend it! Belarus, part of the Newly Independent States (N.I.S. ), is a vast country with stretches of unbroken birch groves, large forested marshlands and gently sloping green fields amidst wooden villages that time forgot in the 18th century. Belarus borders Russia in the north and east, Poland in the west, Latvia and Lithuania in the northeast and Ukraine in the south. 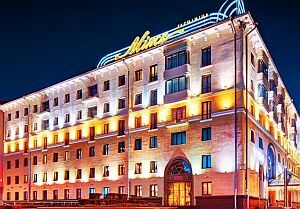 Minsk is the capital of Belarus and was completely rebuilt after the Second World War. In a country rich in war memorials, Minsk is the greatest of all testimonies to the atrocities of the Great Patriotic War. It's estimated that nearly half of the city's population perished during WWII. Today, Belarus is striving to balance the preservation of its independence with the need for economic partnership with neighbouring Russia. Today we have a city tour including Independence Square with the House of Government and "Red" Krasny Roman Catholic Church; Victory Square with its tall grey obelisk and eternal flame honouring the heroes of World War II; Troitskoye Predmestye (Trinity Suburb) -- restored buildings of the 19th century, Holy trinity Cathedral and St.Catherine's Church -- architectural monuments of the 17th century. Our attention then shifts to Belarus as an ancient country with rich history and folklore. We visit the Dudutki Complex, created in order to present the oldest forms of culture and daily routine of the medieval people of Belarus to younger generations and foreign visitors of the state. The founders of the complex pursued the goal to restore a 19th century Belarusian manor with all the subsidiary services and workshops that existed here only decades ago. These include stables, pottery, forge, cheese dairy and several others – all in full order and operational. In the course of the tour you will hear about the development of the Belarusian village and the history of folk crafts that were practiced by the local peasants to improve their standard of living. Today's day trip from Minsk takes us to Nyasvizh, a great place to get in touch with Belarus's past. This quiet but green and attractive town is one of the oldest in the country, dating from the 13th century. It reached its zenith in the mid-16th century while owned by the mighty Radziwill magnates, who are responsible for building the palace that is the town's most outstanding attraction. Today's excursion also takes us to Mir Castle (Mirsky Zamok), an outstanding example of 16th-century fortification art. In 2000 UNESCO designated Mir Castle a World Cultural and Natural Heritage site for its successful blend of Gothic, Baroque and Renaissance architecture making it one of the most impressive castles in Europe. We get the morning off to a somber start with a visit to the Khatyn National Memorial Complex. In January 1966, the Central Committee of the Communist Party of Belarus built the memorial complex in memory of the hundreds of Belorussian villages destroyed by Nazis during this period, making it the most significant war memorial in Belarus. Sadly, the Khatyn massacre was not an unusual incident in Belarus during the second World War. At least 5,295 Belarusian settlements were burned, destroyed by the Nazis and some or all their inhabitants were killed as a punishment for collaboration with partisans. Altogether, over two million people were killed in Belarus during the three years of Nazi occupation, almost a quarter of the country's population. The Khatyn complex has 26 chimneys with bells -- one for each of the houses in the village -- which ring out every minute. Each chimney has a plate where listed family members who died. 6m bronze statue called "The Unconquered Man," stands at the center of the memorial complex as an homage to Joseph Kaminski and his son. There is also a small museum with photo gallery on the territory. We also visit the Mound of Glory and Museum of Great Patriotic War. We include lunch today and leave dinner on your own in the event that you choose to attend a cultural performance this evening. Your Tour Leader can assist with plans. Today we travel by road to Grodno (Hrodna) and enjoy a walking tour on arrival. We begin our walking tour at Market (Soviet) Square, the Synagogue, the firefighting watchtower, and other attractions. Then we drive to see the 19th century New World (Novy Svet) district and the former Gorodnitsa area behind Lenin Square. The walk will be extended along Ozheshko Street to see the parish Russian Orthodox Church and a protestant church – the only operational Kirche in Belarus. Our sightseeing in Grodno will also include the Church of St. Boris and Gleb (Kalozha Church), nominated for inclusion as a World Heritage Site. Located on the riverbank, it dates back to the 12th century and, in spite of severe damage by time and nature, it's the oldest operational church in Belarus. After a brief ride across the modern city of Grodno we will arrive to the Castle Mound where we find the remains of royal castles and splendid Neman River panoramas. Today we travel by road to Brest, first mentioned in 1019 as Bierascie. It is believed that ancient city's name comes either from the word "bierast" -- a species of elm, or from the word "bierasta" meaning birchbark. The city's name was changed several times during its history. In the beginning of the 18th century the city's ancient name was changed into Brest-Litowsk. New name lived till the beginning of the 20th century when its second part was discarded and the city has become simply Brest. A highlight of today's tour will be Brest Fortress, founded on the 1st of June in 1836. The territory of the old town was given for its constructi; the Citadel is the main fortification of the fortress. It was placed in the central island and the Volyn, the Cobrin and the Terespol fortifications surrounded it. The fortress isn't merely a remarkable military construction; it is also an interesting architectural complex. The Brest fortress got universal fame during the Great Patriotic war and one of the most important Soviet WWII war monuments marking the heroic resistance of the Red Army against the surprise German attack on June 22, 1941. The ruins of the White Palace are visible from the fortress and mark the site where the 1918 Brest-Litovsk treaty was signed. Our visit will also include a walking tour of the city centre. Our journey continues to Lviv, Ukraine, with a full day of travel. Crossing the border we arrive in the "capital" of Western Ukraine and one of the country's most impressive cities. Founded in the 13th C. by King Danylo Halytckyj, it was named in honour of his son Lev (Leo). Through centuries of Polish, Austrian, and Soviet occupation, Lviv was the gateway to "the East", but with independence in 1991, Lviv is finally free to develop its own Ukrainian identity. 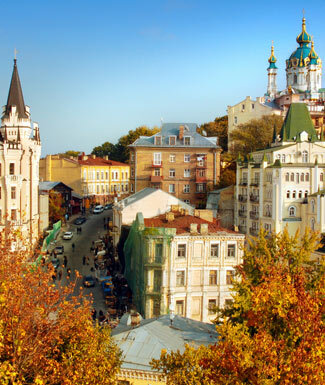 Lviv, a UNESCO World Heritage Site, has a rich and impressive history. Numerous historical events are concerned with the city and Lviv buildings still keep the spirit of past centuries; cozy streets and fascinating monuments make it a unique attraction among the Ukrainian and Eastern European cities. 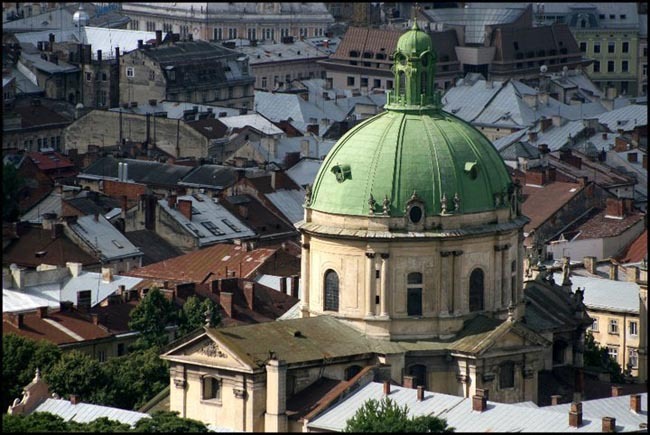 Lviv's architectural landscape joins the monuments of numerous styles and different epochs. From the gothic 14th century Latin Cathedral, to the baroque of St. George (Sviatoho Yura) Cathedral. Renaissance-style Bernardine Monastery and Chapel of Boimes coexist with the strict simplicity of Armenian Church. We have a half-day walking tour of the city, including the following major sites: the High Castle or Prince Hill, where the fortress used to be, with the panorama lot; the Church of St.Nicholas (13th century); the Church of Assumption and the Kornyakt Belfry (16th century); the Church of St.Parasceve (17th century) and its unique 70-icon iconostasis; the Cathedral of Dominicans (18th century); the Old Pharmacy; Market Square (over 40 14th -- 18th century buildings; St.George's Cathedral (18th century); St.John's Cathedral (14th century); the "Vienna-like" Prospekt Svobody (Liberty Avenue); the Opera House (exterior). Your afternoon is free for independent exploration. Today we will drive out to the Lychaivsky Cemetery. With the same sort of overgrown grounds and Gothic aura as the famous Parisian necropolis, Pere Lachaise, is the the final resting place for more than 400,000 people. A trip to L'viv wouldn't be complete without a wander here. Initially opened in 1787 in compliance with an Austrian law to move burials from the centre of town, the cemetery soon became one of Europe's finest. Generations of Lvovians were laid to rest here: intelligentsia, bourgeoisie and nobility. We also visit the Lviv Museum of Folk Architecture and Rural Life, an open-air museum containing 120 monuments of folk architecture including six wooden churches, which create a genuine atmosphere of Ukrainian villages from different regions of the country. Time at leisure. We include lunch instead of dinner today to free you up for the opera or theatre. Your Tour Leader can help you plan your evening. Today we drive to Kamianets-Podilskyi. After we check in to our hotel we'll embark upon a afternoon visit of town and fortress. No epithet is able to describe fully the splendor of this ancient city, which no other city can match, even in Europe. An incredible quantity of amazing 11th-19th centuries monuments and landmarks are concentrated on the territory of the Old City. They are a big reason why this city is on the list of UNESCO World Heritage Sites. Despite the twists in history, Kamianets-Podilskyi has managed to preserve its priceless buildings almost unchanged. The main sight is still the Ancient Fortress, considered to be one of the best samples of fortification buildings in Eastern Europe. In the towers and dungeons of the fortress are unique exhibitions, which brightly illustrate the pages of Kamianets-Podilskyi's history: scenes of medieval trials, defenses of the fort, and weapons collections are all depicted. The sacral architecture of Kamianets-Podilskyi is no less impressive – it fascinates with its richness and variety of represented cultures. A special place among the treasures of the city belongs to the Armenian Cathedral and to the St. Peter and Paul Catholic Church, an example of the beauty that combination of two different religious architectures can bring. The complex of the Dominican Monastery also bears the imprints of different epochs and styles. And St. Nicolas's Catholic Church, included in the complex, is considered to be one of the most ancient city temples. Because of so many historic monuments, Kamianets-Podilskyi gives you the opportunity to dive into a truly medieval atmosphere. Today we cross into Moldova. En route we stop at Khotyn Fortress, one of the most popular objects of the kind in Ukraine. This fortress impresses with its power and impregnability and is one of the best-preserved fortifications on the continent. We continue to Soroca and a city tour on arrival. The city is famous for the impressive walls of Soroca fortress, whose historical interest is reflected in its walls preserved since the Middle Ages. Gypsy Hill is a Unique Quarter of the Gypsies, settled purely by the Roman people led by a gypsy baron in Moldova. During Soviet times they managed to successfully combine their customs with those of local inhabitants. Later the hills of Soroca town got the name "Hill of Gypsies" where the elegant houses and buildings under the name "Swallow's nest" were built. "The Candle of Gratitude" was lit on 27th March, 2004 to honour the author of a well-known Moldavian ballad "Miorita". It's actually a church in shape of a burning candle made of stone. An amazing view from this striking building opens to the river Nistru. Today's route takes us to Orheuil Monastery. Among Moldova's greatest wonders are its monasteries, and we visit the most famous, the cave monastery in Orhei Vechi. This 13th century church was excavated from a limestone cliff by Orthodox Christian monks who believed the cave would be resilient against invaders. Archaeologists have recently discovered ruins of Turkish baths and a protective wall built in the 15th century, which surrounds the religious complex. Stefan the Great erected a fortress in Orhei Vechi in the 14th century, destroyed by Tartar invaders in 1499. The monastery was inhabited until the 1th century; closed during Soviet times, it was reopened in 1996 and services are now held regularly. We continue to Chisinau, the capital of Moldova. The history and life of Moldova through the centuries is best presented in the History and Regional Lore Museum, a	beautiful Turkish-style complex, which we will visit along with the Fine Arts Museum, which houses good examples of Russian, West European, and Moldovan paintings, sculpture and applied arts. A visit to Moldova would not be complete without a trip to the Moldovan wine country. We visit Cricova, the world's largest wine cellar. It is actually a subterranean city with winding streets extending for 60 kilometres (37 miles). The street names orient visitors toward Str Cabernet, Str Pinot or Str Merlot. There are over one million bottles	of white wines -- 648 types are stored in the cellars at a uniform temperature of 12C (54 F). A tour of Cricova is one of the best ways to sample the wide variety of Moldovan wines and champagne, which are gaining great popularity outside Moldova's borders, including Western Europe and North America. We depart Chisinau for the town of Bendery, the site of a fortress commanding the Dneister crossings since the second century BC. The original 12th century fortress wall was built by the Genoese who traded actively with Black Sea ports and fell to the Turks in the 16th century. The rectangular fort with its citadel was built by the Turks in the 1530's and was besieged several times by the Russians in the 18th century as part of their drive for Bessarabia. It was all but destroyed in the German retreat of 1944. We continue our journey, traversing the valley of the Dneister River with its orchards and vineyards. Our destination is Tiraspol, founded as a stronghold by General Suvorov in 1792 but named after the ancient Greek colony of Tiras. Built in the grid pattern of 18th century "new towns", Tiraspol retains traces of the original fort. Some of the older houses, with their traditional Moldovan balconies, betray a Turkish influence. Our tour will also include a visit to the famous "cognac" factory. We drive to Ukraine border and continue to Bilhorod-Dnistrovsky. En route we visit the impressive fortress on the banks of the Dnister River. Stefan II of Moldavia founded the 13th century fortress, one of the Ukraine's largest, on a strategic spur of land overlooking the Dnister estuary. The drive to get here is picturesque, taking us through a rural region of quiet villages, farmland, rural communities, and providing us with an occasional view of the Black Sea. From ancient times, Odesa (Odessa) was inhabited by Scythians, Sarmats, Greeks, and Slavs. In the times of Kyiv Rus it was a part of this huge Slavic state. In the 13th century it was annexed to the Tartar-Mongol empire, the "Golden Horde". At the beginning of the 15th century it was annexed to Lithuania, and in some 50 years, to Turkey. In 1791 the territory became a part of the Russian Empire. Today we enjoy a half-day city walking tour, including many architectural sites of 19th & 20th centuries, many of them designed by world famous architects and engineers. Most notable are the Opera House (resembling the Vienna Opera and the Dresden Court Theater built in 884-87); the Marine (Potyomkin) Stairway (1837-41) – one of the largest stairways in the world; and the heart of Odesa and immortalized in Sergei Eisensteins's 1925 film, Battleship Potemkin; Deribasivska (Deribasovskaya) Street with plenty of shops, cafes and restaurants. We will also visit the five-domed Uspensky Cathedral. There will be some free time in the afternoon; Odesa is a great city for walking and this free time will give you a chance to do some exploring on your own. We include lunch today to free you up for evening cultural performances. Today we board our coach for a visit of the Odesa Catacombs, created nearly 200 years ago during mining of building materials that were used to build the city. Currently it is the maze of 2500 km of entrances, exits, caves, and tunnels. During the WWII campaigns, in 1941, when the German and Romanian armies occupied Odesa, the Soviet military headquarters gave the order to organized the partisan resistance, and the catacombs were chosen as the camp for the partisans. Their store of provisions and weapons allowed tham to survive underground for half a year. The partisan unit was fighting against the Nazi and Romanian army during the entire period of occupation. We will also take the oppportunity to visit Launcheven Beach to get close to the Black Sea. We then transfer to the airport for our flight to Kyiv. 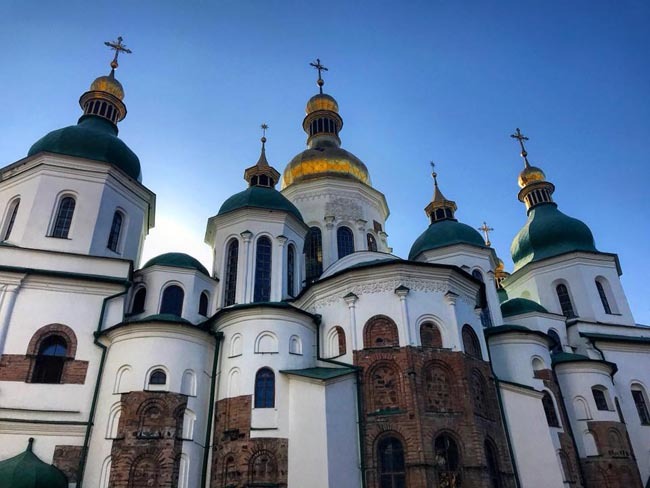 Today we have a full day touring Kyiv, including the cathedral of Hagia Sophia, the oldest cathedral in Ukraine. Founded in the early 11th century, and largely rebuilt during the 17th and 18th centuries, it is now a museum with beautiful Christian frescoes. St Sophia Cathedral is inscribed on the UNESCO list of the most important monuments of the world's cultural heritage. We also see the Golden Gate, St Andrew's Church, designed by Rastrelli, the famous architect who built the world famous Winter Palace in St.Petersburg; St Michael's Monastery, monuments to Yaroslav the Wise, Princess Olga, and the monument to Prince Vladimir. 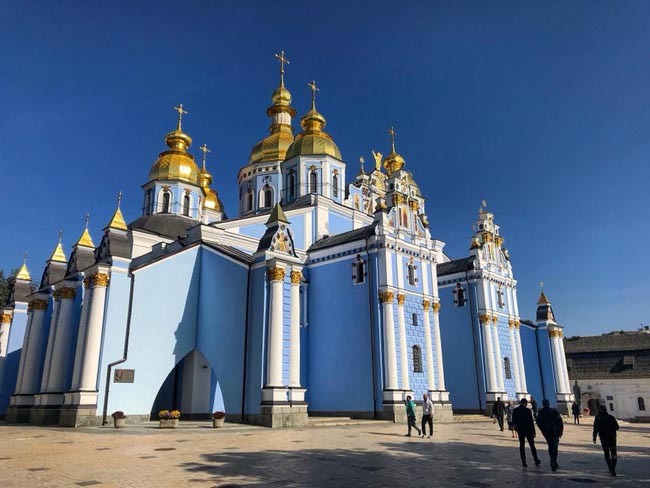 We also visit the Kyiv-Pechersk Lavra Monastery where we will be able to see the famous caves, one of the most sacred places of Orthodox Christianity. The museum boasts a wealth of precious historical items and collections of ancient books and icons. Our sightseeing will also include the suburbs of Kyiv to the sobering memorial at Babi Yar. Kyiv had a Jewish population of 175,000 on the eve of the Nazi invasion of the Soviet Union in 1941. The Nazi forces captured the city in mid-September; within less than a fortnight, on the 29th and 30th, nearly 34,000 Jews of the ghetto were brought to a suburban ravine known as Babi Yar, where men, women, and children were executed over two days. In subsequent months, most of the remaining population was exterminated. Lunch will be included today to provide a free evening. Today we embark on our full-day tour to the site of Chernobyl (2.5 hours each way). * Of course, Chernobyl is well known for the nuclear accident that occurred there on April 26th, 1986 at the power plant that was under the jurisdiction of the USSR This is considered to be one of the worst nuclear disasters in history as the contamination spread across much of Europe and the Weste USSR. Our tour will include access to the 30-kilometre Exclusion Zone where we will get a briefing on the practices used to de-contaminate the zone and to visit the town of Chernobyl, including the Wormwood Star Memorial, the St Ilya Church, and the memorial to "Those Who Save The World". Our tour will proceed to the 10-kilometre zone where we will take in the remains of Kopachi Village and Pripyat town and a close view of Reactor Number 4. Tours have now been running to the Chernobyl site for some time and we will be given a briefing on the site visit with regards to safety issues, but there is no reason to be alarmed for one's safety provided we follow their instructions on how to conduct the sightseeing. * PLEASE NOTE that you must come prepared with long sleeves and trousers (no skirts) and closed shoes only for this excursion. Failure to comply will result in your non-participation. We will return to Kyiv after a full day. PLEASE NOTE that past travellers have commented on Kyiv's wealth of attractions and that it would be a great place to extend for some independent sightseeing. 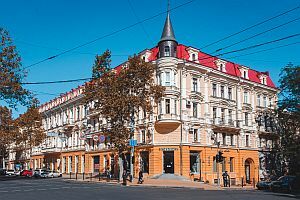 Directly located in Minsk’s historic and cultural centre, next to Gorky Drama Theatre, this traditional hotel is just 500 metres ...	the Belarusian National Arts Museum and Dynamo Stadium. 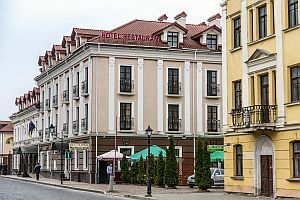 A 10-minute walk from St. Francis Xavier Cathedral, this laid-back hotel is 2 km from both Old Hrodna Castle and ...	Hrodna Castle. 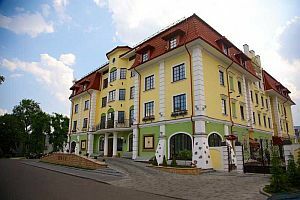 Set in a grand building with a colorful exterior, this elegant hotel is 2 km from Brest Railway Museum and ...	km from Brest Fortress. 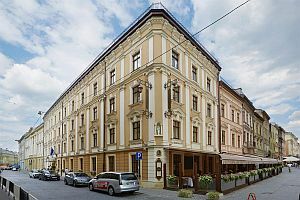 Leopolis is the only luxurious hotel in Lviv located right in the heart of historical part where you can still ...	the romanticism spirit and the old city Bohemian atmosphere. The hotel is a perfect place for rest after a vigorous tourist walk or after a business meeting. Leopolis is located in the restored building that is listed as a UNESCO World Heritage Site. It’s a great place to explore history, culture and entertainment that are vastly offered by Lev’s City. 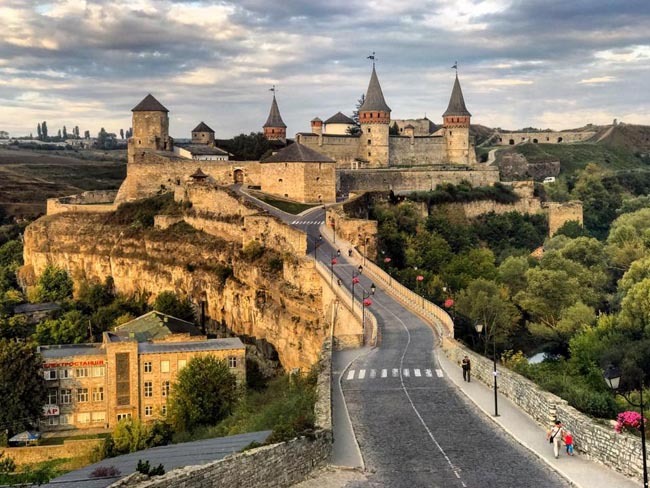 A 3-minute walk from Saints Peter and Paul Cathedral, this laid-back hotel in a refined building is a 12-minute walk ...	Kamianets-Podilskyi Castle. 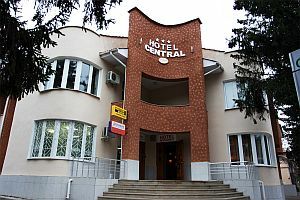 Situated in the center of town Soroca, the north part of Moldova, The Hotel “CENTRAL” is the most dedicated place ...	can ensure you the best time spending. Vila Verde Hotel & Tourist Complex is represented by an ensemble of 3 buildings with terraces. 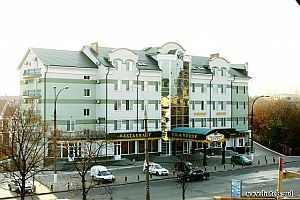 The hotel opened in ...	and is considered among the first hotels assigned with 3 stars category in Republic of Moldova. UNO Design Hotel is located in the heart of business, cultural and historical part of the city, just a few ...	from the Opera House and Deribasovskaya Street, and 15 minutes from Lanzheron Beach. Hotel is created for those, who are in a dynamic rhythm of life, always in the center of events and in harmony with his own. 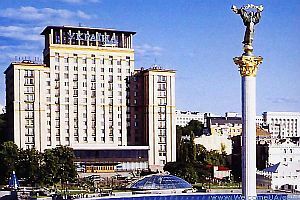 Featuring 371 renovated guest rooms, four-star Hotel Ukraine is a 14-storey skyline icon located in the heart of downtown Kiev ...	is just steps away from all major attraction. Staying in one of our rooms you will have the most fabulous views of Maidan (Independence Square) and Khreschatyk. All major events in the capital happen on the main square of the country, so you will always be in the center of all events in Kiev. Breakfast and dinner (hotels & local restaurants) daily and one lunch. All transport, sightseeing and entrance fees for sites noted as 'visited' in the detailed itinerary. Gratuities for local guides, drivers, restaurant staff, porters. Airport transfers for land & air customers. International airfare to/from the tour. Tour Leader gratuities, lunches, drinks, personal items (phone, laundry, etc), domestic and international air taxes (if applicable), excursions referenced as 'optional'. Airport transfers for Land Only customers. Our post-reservation trip notes offer further guidance on optional meal costs, shopping and visas. Only Belarus requires a visa in advance (for a fee, not included) for which we will provide assistance. You will need to be prepared to surrender your passport during the application process. This tour is offered in the late spring and early fall when temperatures and humidity are quite comfortable. Rain showers are possible at any time of year. Our later Sept/Oct date will experience cool weather and a greater possibility of showers. Land transport throughout by private air-conditioned motor coach, 24-36 seats depending on ultimate group size (see 'group size'). Though we will have a couple of full bus days there are plenty of stops of interest. Our #2 difficulty rating on this tour refers mostly to full days of travel and sightseeing, multiple walking tours on uneven/cobbled surfaces, and short walks to dinner. Well-located, air-conditioned, mid-upper range hotels (4-5 star, a couple 3's) throughout. All hotels have en suite bath, though some may have shower only (no tub). Porter service is available but you MUST be independent with your luggage, especially at airports. Single rooms are limited and likely smaller than twins. Click on "Map & Hotels" for detailed information.